Presenting to you another traditional Malabar snack- Turkey pathiri or Turkish Pathil.Why did the Malabaris name it Turkey pathiri- is it the bird Turkey or the country Turkey been referred to? Some folks call it Kumbala Pathil resembling wintermelon. This delicacy is stuffed fried puris within another stuffed fried puri. You can make as many layers as you want, if you have the patience to make it. 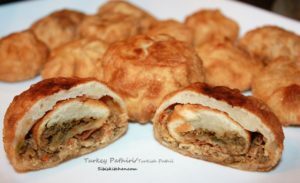 Some recipes have a whole boiled egg within the innermost fried puri.I have the recipe for two layered Turkish pathiri with beef filling in the inner puri and chicken filling in the outer puri. 1.Heat one table spoon oil in a thick bottomed pan and sauté the onions, green chillies, ginger and garlic. 2.Now add chilly powder, garam masala and salt. Let it roast for few seconds. 1.Mix the flour and salt with enough water and knead to a smooth dough. 2.Divide the dough into one third and two third portions. 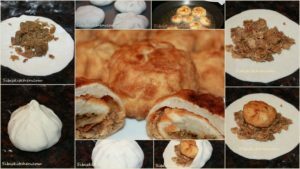 With the one third portion, make 8 small balls and roll out small puris with a chapathi roller or press. 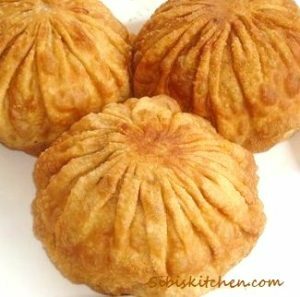 3.Place 1 teaspoon of beef filling over the small puris and shape them into rounds by bringing the edges together and pinching in the centre.Have a look at my pictures to get an idea.Repeat the same process with the rest. 4.Heat oil in a heavy bottomed pan or kadai and deep fry all of them.Keep aside. 5.Divide the remaining dough into lemon sized balls and roll out to make 8 bigger puris and keep aside. 6.Take a bigger puri and place a tablespoon of chicken filling in its centre. 7.Place a previously fried stuffed poori over the chicken filling. 8.Draw the round edge of bigger puri over the fried puri together at the top like how you pleat a sari. Remove the excess dough at the tip. 9.Repeat the process with the remaining puris and fillings. 10.Deep fry the Turkish pathiris in batches till they turn golden brown. 12.Serve hot with ‘Maggi hot and sweet’ tomato chilli sauce. Thanks for the feedback Shahana!